No PC is required to perform the studies on the crimp presses. PAL 4000 has internal memory for up to 100 press studies. Data is easily transferred from PAL 4000 to a PC by USB. The rechargeable internal battery provides up to 5 hours working time on the crimp presses. Leave the PAL 4000 on the charger when not in use. PAL 4000 comes in a rugged case with foam compartments for all required items. PAL 4000 is a tool used to check the capability of your crimp presses. It is quickly installed in a crimp press just like an applicator. The press is cycled 100 times and statistical calculations are made regarding the Shut Height and Force Repeatability. If basic height and force repeatability standards aren't met the press is flagged for maintenance. 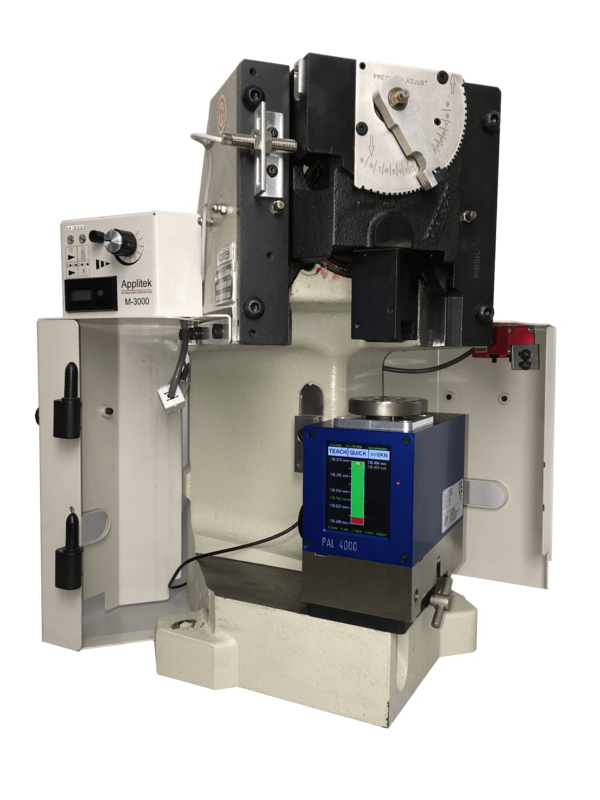 PAL 4000 is used to calibrate the shut height of all your crimp presses. A common shut height standard is 135.78mm (5.346inch). After shut height calibration your applicators can easily be moved from press to press without problems. PAL 4000 is also used to trouble shoot Crimp Force Monitor (CFM) issues. When the CFM is giving a lot of alarms and nobody knows why install the PAL 4000. If the CFM runs perfectly with PAL 4000 you can quickly conclude the problem is with the applicator.